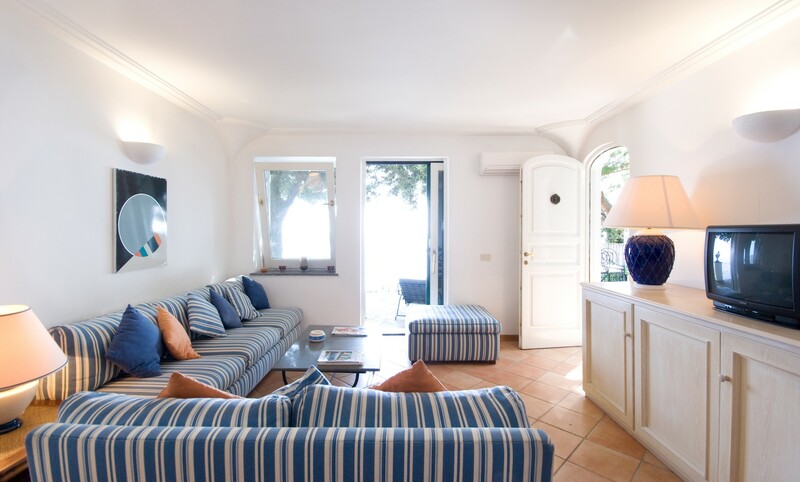 Villa Il Tramonto is blessed with countless privileges and comforts on this account. 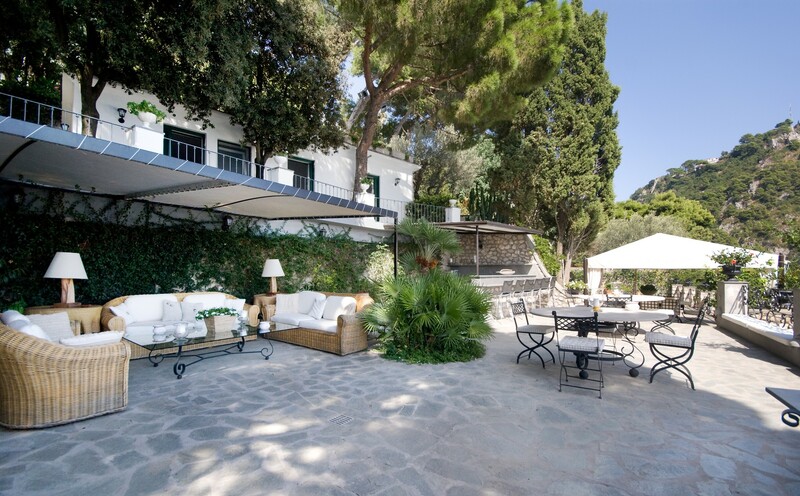 The villa is easily accessible both on foot (by crossing the famous little piazza, full of colourful Mediterranean flowers and plants), or by car (there is a car park on the villa’s grounds). 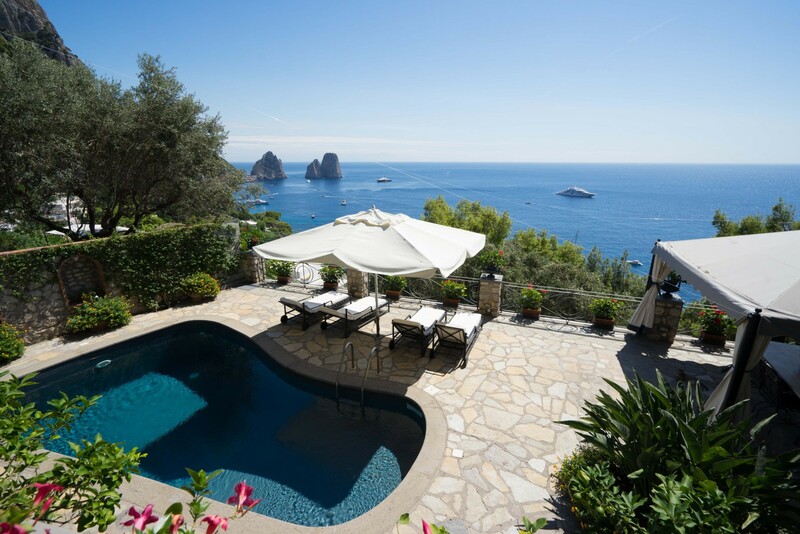 It’s fabulous position right by the Bay of Marina Piccola allows it to offer one of the best terraces on the whole island of Capri and enjoy the sunrise each morning. It is surely the right place to organize a cocktail party or a dinner for a special event. 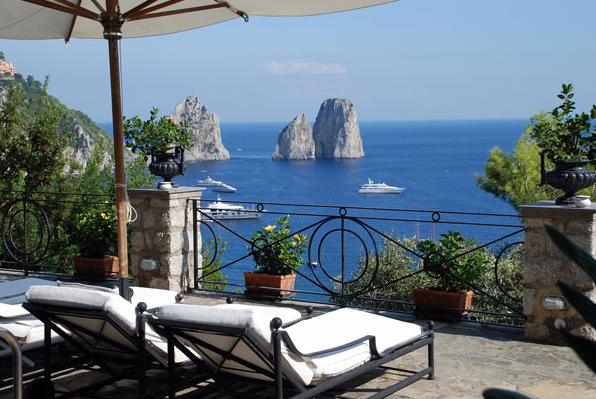 Capri is the Mediterranean island that, over the years, has been visited by intellectuals, artists and writers, all of whom were enthralled by its magical beauty. The coast is dotted with numerous caves and creeks that alternate with steep cliffs. The most famous of them all is the Grotta Azzurra or Blue Grotto, whose magical light effects have been described by many writers and poets. 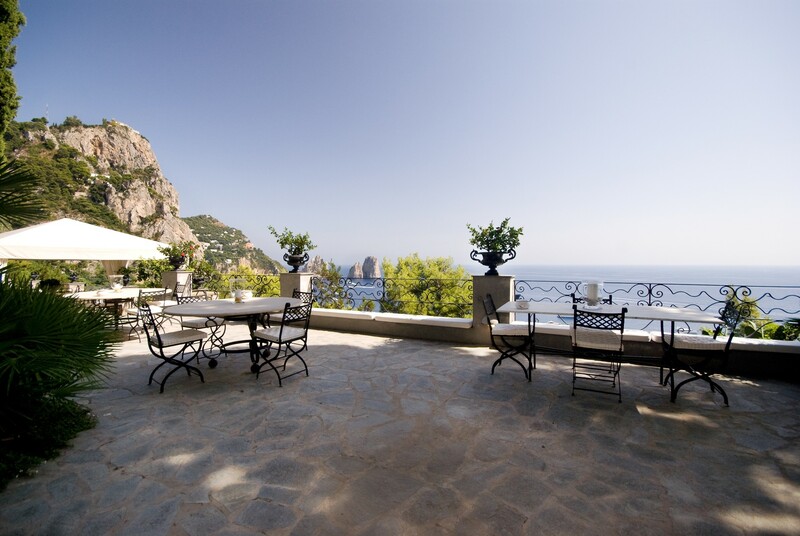 The famous Faraglioni are another characteristic feature of Capri: three small rocky islands near the shore that create a striking scenic effect. 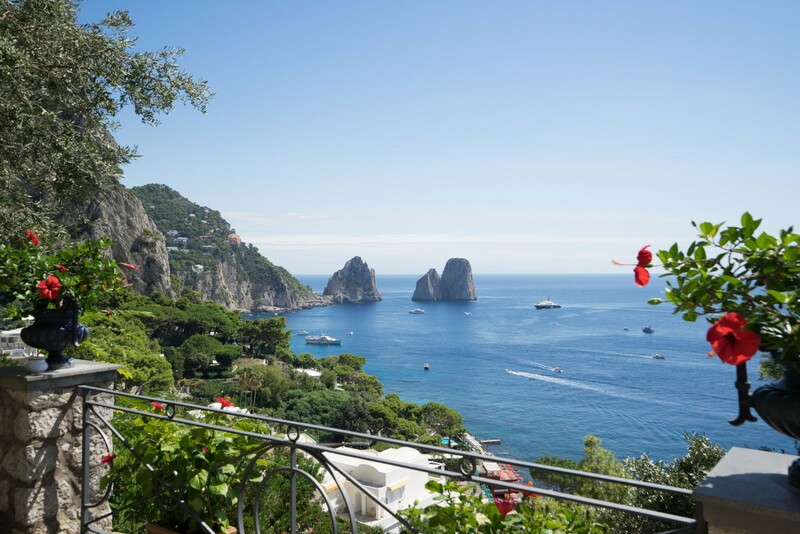 The main towns on the island are Capri, Marina Grande and Marina Piccola, which is on the other side of the island, and Anacapri. 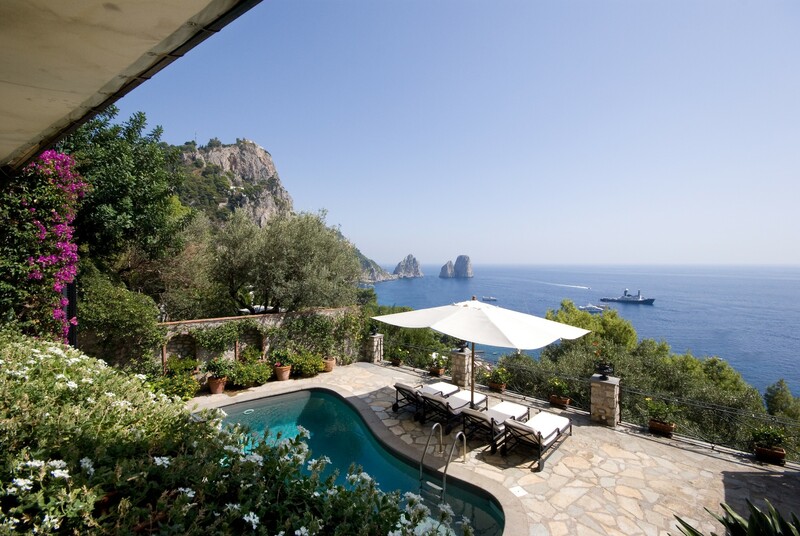 Located right above the exclusive beach area of Marina Piccola on the Eastern coast of the island, this luxurious villa looks onto the infamous Faraglioni rocks, two enormous vertical rocks protruding from the sea serving as the international symbol of Capri and seen in advertisements the world over. 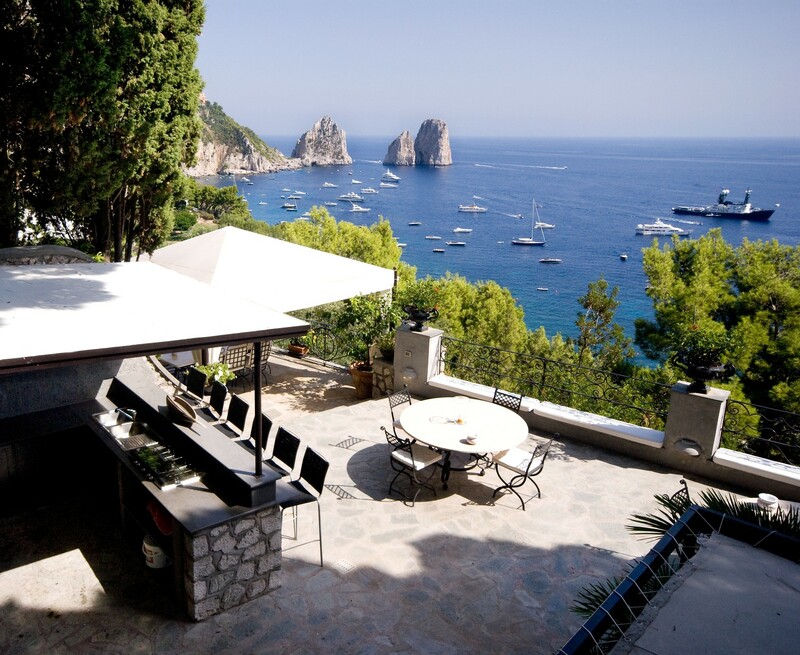 The beach in Marina Piccola, located within a short walk from the villa, offers umbrella and sun lounge rentals. There is also a bar and a restaurant. 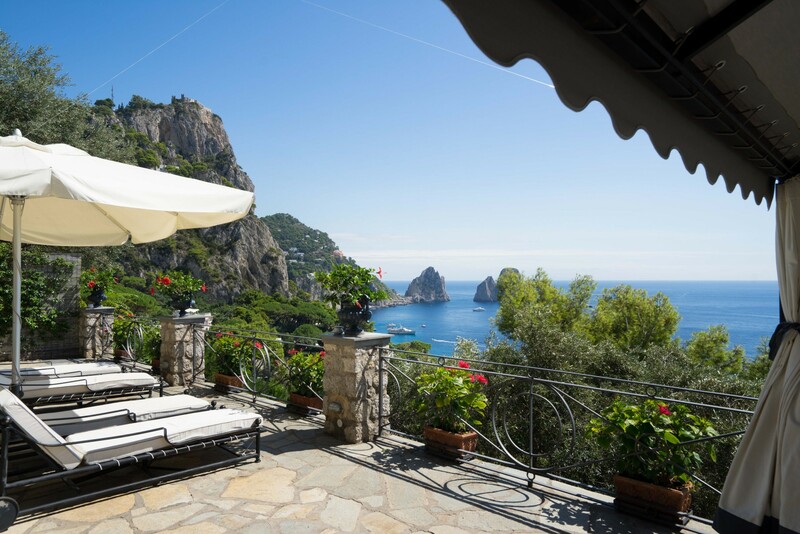 A supermarket and restaurant are just 200 meters from the property while all the main facilities, such as banks, bars, shops, etc., are located in Capri town about a 15-minute walk or 5-minute drive. There is a bus stop for the local bus located right in front of the entrance gate of the villa. 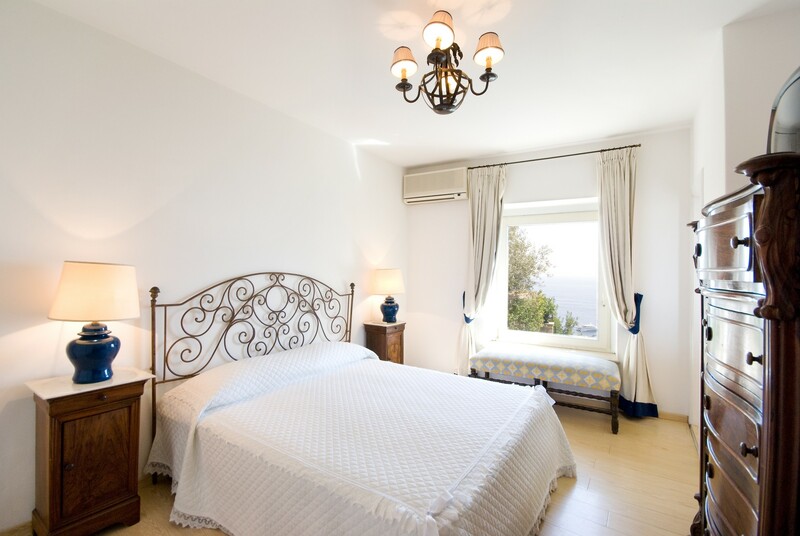 Bedroom 2: Double bed, En-suite bathroom with shower, Air conditioning, TV, Private terrace. The furnishings are elegant and of a high. 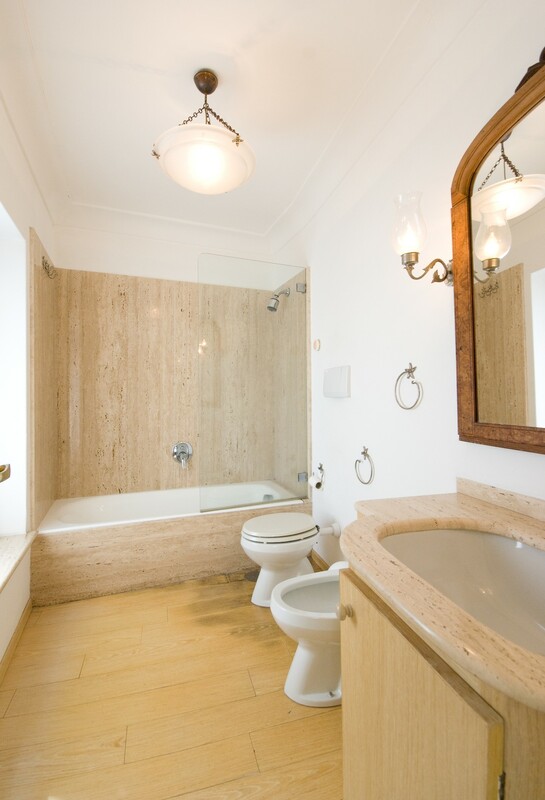 The bathrooms are new and comfortable; all rooms have great sea views. There is also air-conditioning throughout. 35 steps lead from the gate down to the ground floor, where the pool is located. The villa is located directly at poolside. 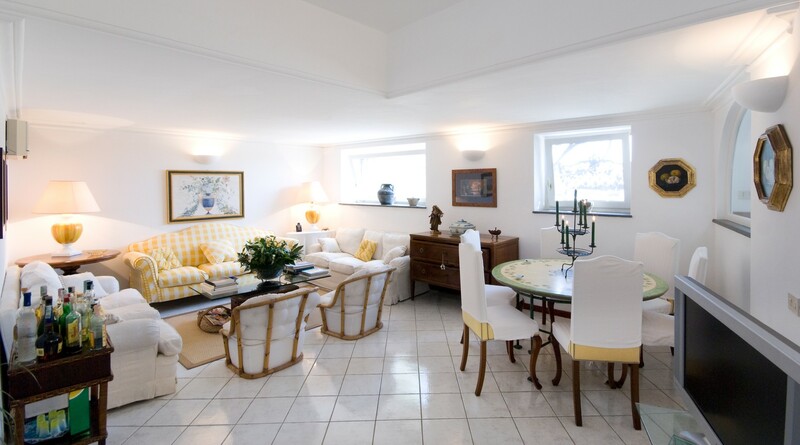 4 steps down from the entrance lay the living/dining room with tiled floor, well furnished with a round wooden table, 2 armchairs, and a fireplace. 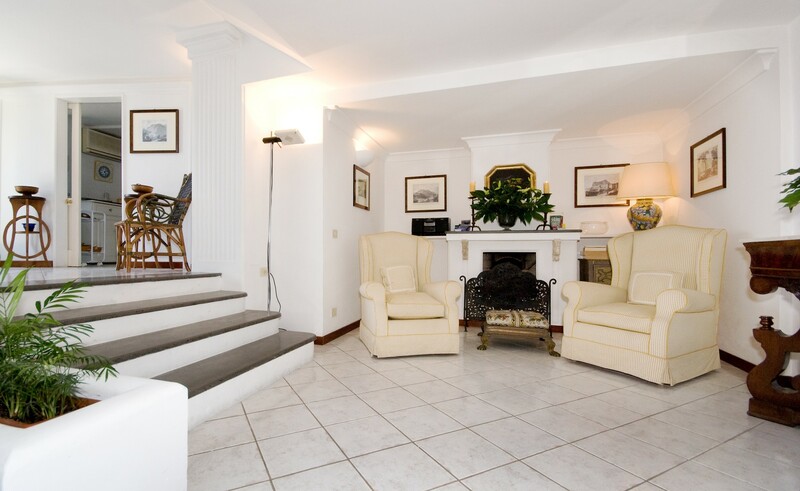 The lounge, 4 steps further down, is comfortably furnished with sofas and a TV. 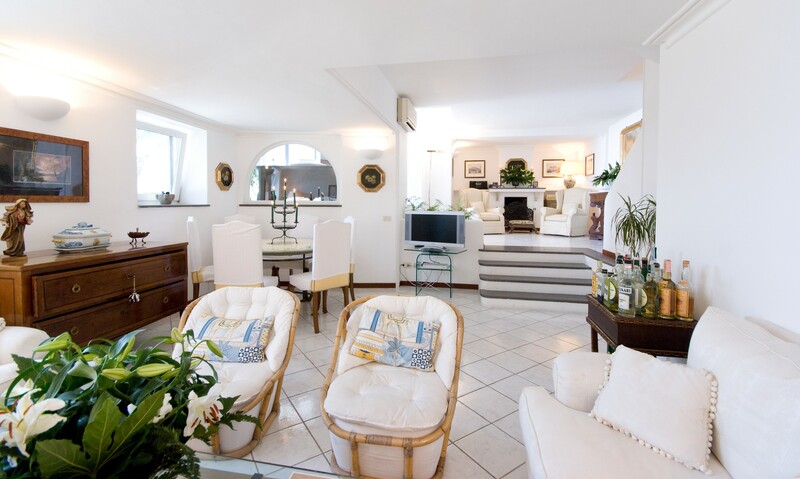 The interiors are elegantly furnished and allow for direct access to the pool. 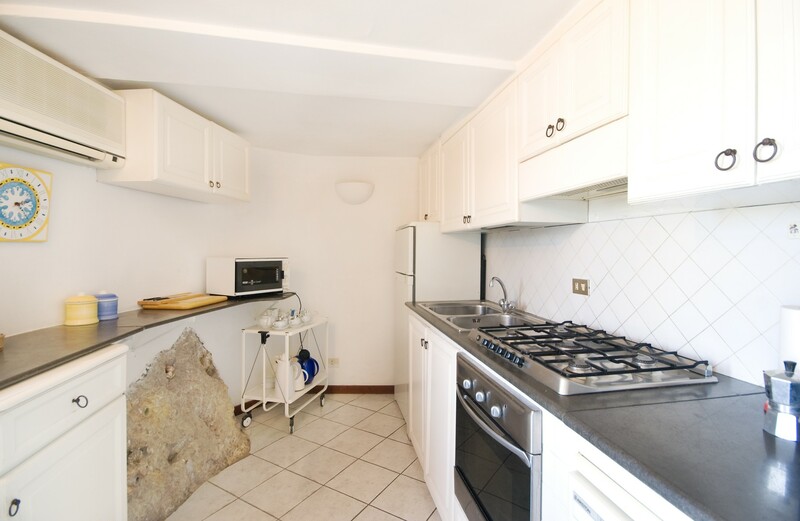 The small kitchen is well equipped with a dishwasher, 5-range stovetop, oven, microwave, refrigerator, and freezer. 18 steps up from the living room lead to the two bedrooms, both with en-suite bathrooms (one with shower unit, one with shower/bathtub unit). There are two double bedrooms with bedside tables, dressers, closets and a TV. 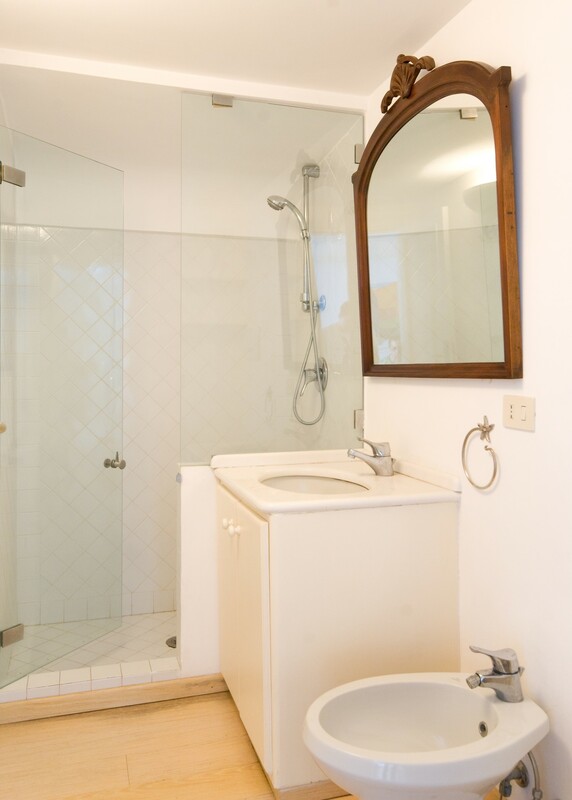 There is also a bathroom with bathtub and panoramic windows. 4 steps up from the first bedroom lay the second double bedroom with an iron bed head and built-in closet, TV, and en-suite bathroom with a glass shower box. 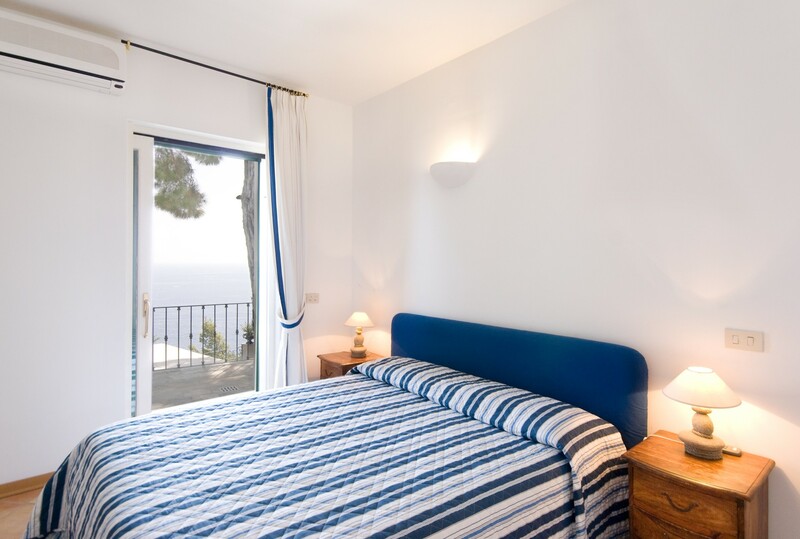 Access through a French door leads out onto a private, furnished terrace with amazing sea views (although this is a luxury that both bedrooms enjoy). 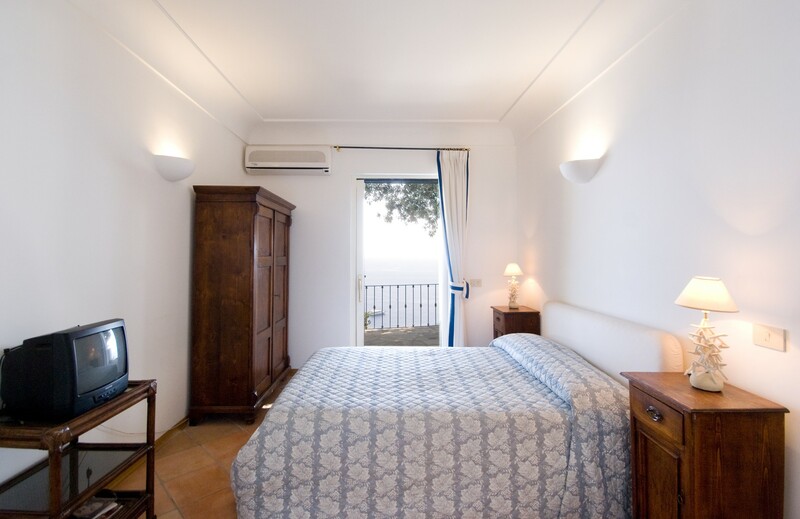 The property’s guesthouse, features a small living-dining room, with direct access onto the sea view terrace through a set of French doors. 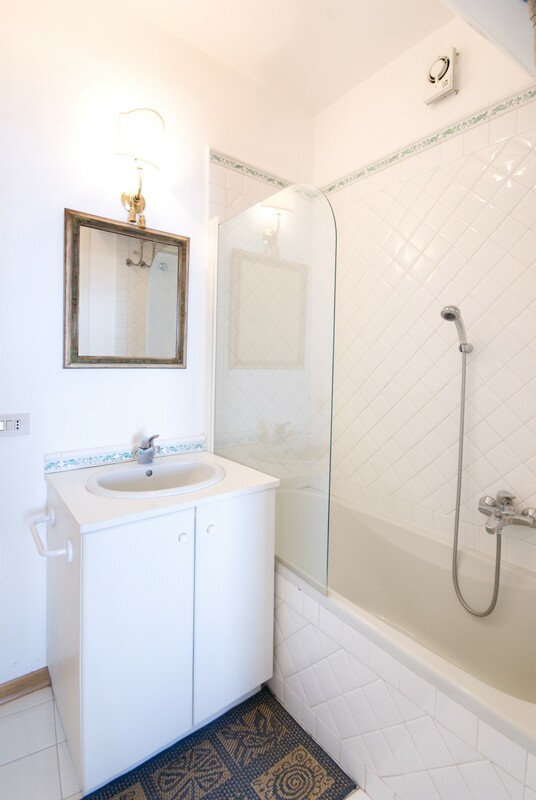 The guest villa offers a two double bedrooms, one with en-suite bathroom with shower and tub. 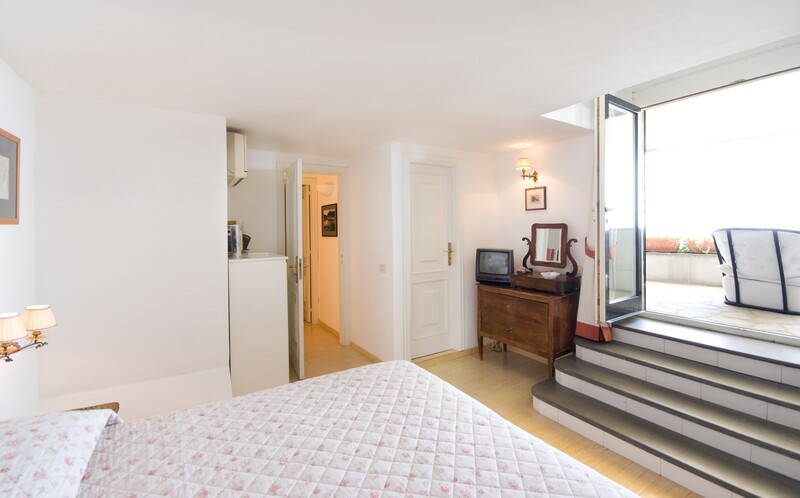 Both bedrooms enjoy a set of French doors leading out onto a panoramic terrace. Spectacular, panoramic and fully functional lounge/terrace with several, large marble topped, round tables with seating for 8 persons each; great lounge area with several comfortable couches and a glass coffee table; an elegant, external dining table situated under a white linen tent, with seating for up to 8, and a full bar and external kitchen unit (with 5-range stovetop, coal barbeque, small refrigerator, and dishwasher) with large marble countertop, external refrigerator and bar stools. The terrace is planted with high palm trees, potted flowers, and natural vegetation, which create an even more private setting. The terrace is the perfect place to host a party or external dinner. 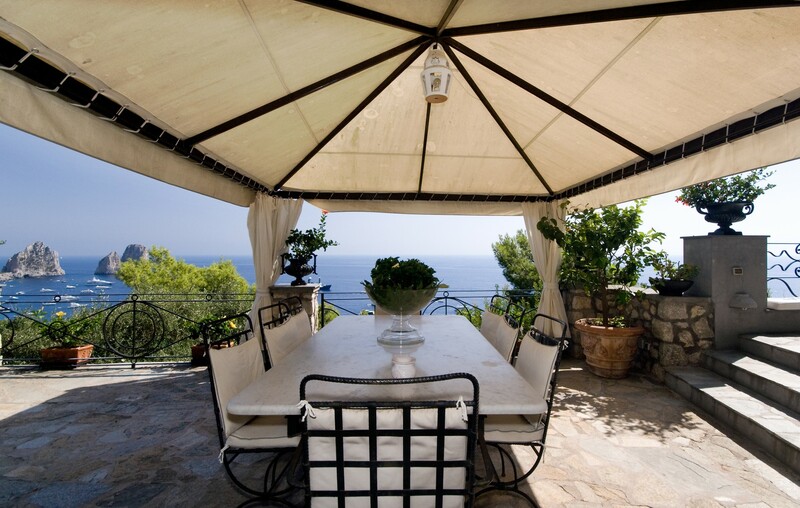 The large terrace boasts some of the most panoramic views on the whole island. There is also a nice, irregular shaped swimming pool (7 m. long x 3,50 m. wide 1.80 m depth) bordered by 4 comfortable lounge chairs, umbrellas, and large outdoor dining area for 8. The villa is accessible directly from the road though a private gate and down a set of steps leading down to the property entrance. Daily continental breakfast (self-service): croissants, sweet cakes, biscuits, seasonal fruit, cereal, toast bread, orange juice, jam, honey, butter, yogurt, coffee and tea.